It has taken a while to create and get this book produced, but it is finally here. The book was written with my friends John Ferguson and Mike Amaranthus. John is a leading Texas composting and soil scientist and Dr. Mike is the country’s leading expert on mycorrhizal fungi. 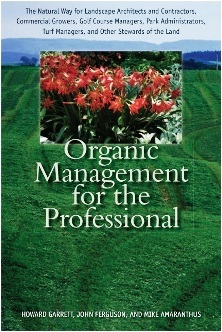 Here is the title and description: Organic Management for the Professional, the Natural Way for Landscape Architects and Contractors, Commercial Growers, Golf Course Managers, Park Administrators, Turf Managers, and Other Stewards of the Land. It's the first comprehensive guide to “going green” in large-scale landscaping. Click here to purchase the book. If you have any questions on this newsletter or any other topic, tune in Sunday 8am -11am CST to the Dirt Doctor Radio Show. The phone number for the show is 1-866-444-3478. Listen on the internet or find a station in your area. Sign up for Howard Garrett's Newsletter.